It’s no mere coincidence, that having endured ghastly mild and loathsome, unseasonal weather for the first autumnal weeks of this year, my desire to get stuck into proper winter food has coincided with a much needed and heralded temperature plunge this weekend. I happen to be one of those diehard weather traditionalists that expect frosts from as soon as the clocks change and snow at requisite intervals throughout the dark months until at least March. It’s all about eating and living by the seasons for me and (don’t get me wrong) although I adore the spring and summer climes, by the end of November I need hearty and warming sustainance accompanied, preferably, by suitable conditions. It’s the season of game, of slow-cooking; braising, casseroling and pot-roasting. Utter delight for a wild foodie, in terms of the provenance from both field and shoreline. Obviously this blog deals exclusively in the fruits that abound in our coastal waters and having been inspired many times, by the American seafood recipes that originate from their Eastern Seaboard, I thought I’d indulge you in my take, on the incredibly satisfying and wholesome chowders that epitomise that style of shellfish cuisine from Chesapeake Bay to Newfoundland. Right now on the Suffolk coast we’re in between seasons. The summer fishing has slowly given way to the colder water species and the departing bass, mullet, soles and lobster, are swiftly replaced by the teeming pelagic shoals of herring and sprats, plentiful prey for the now abundant cod and whiting that move inshore as the sea temperature falls. For this recipe then, I’ve decided to celebrate that transition from summer to winter, by creating a dish that uses both the outgoing and incoming. 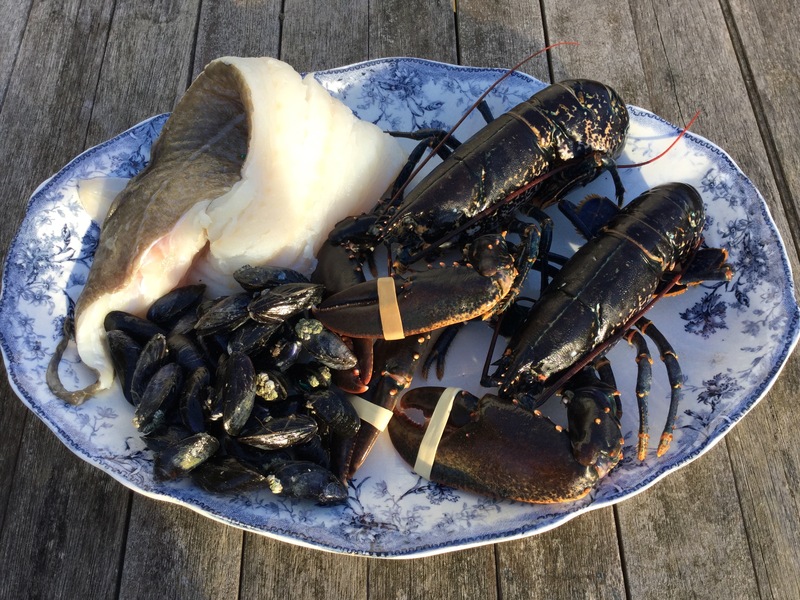 Having managed to acquire some of the season’s last local lobsters (in fantastic condition now), I thought I’d combine their incredible sweetness with the heartiness of the, now sustainably fished, North Sea cod and bejewelled with the another autumnal sensation, local mussels, which add a distinctive tang and succulence to a dish that warms and sustains on darker and shortening days. 1 quantity of mussel cooking liquor. 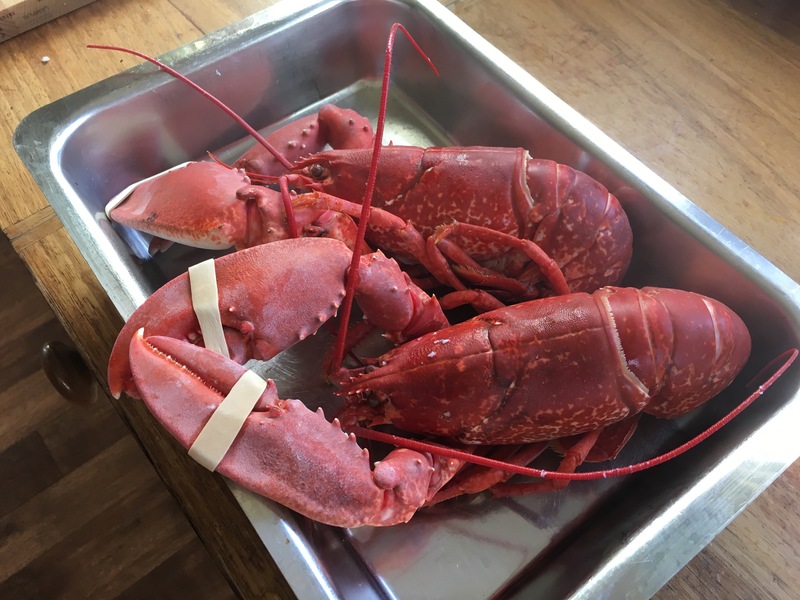 The first thing to do is to boil your lobsters and preferably in (if you have access to) seawater, but failing that freshly sea-salted boiling water. I’ve always preferred to cook live fish, but of course, when purchased, recently-boiled from a known fishmonger, then they’re perfectly acceptable. My two fish were about 500g each in weight and required approx ten minutes on the boil before removing to a plate and allowing to cool naturally (this allows the meat to “set”). Reserve the boiling water for cooking the shells in later for the stock. 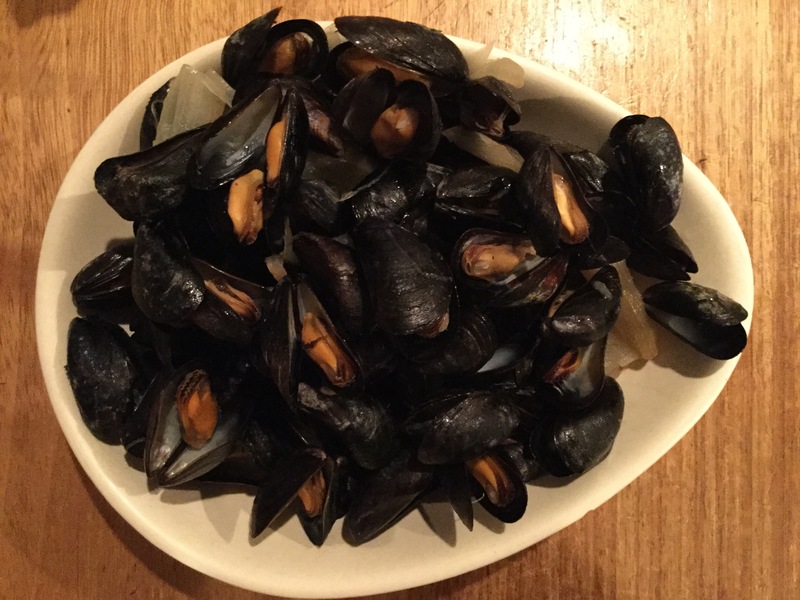 Next cook the mussels by simply steaming them, (briefly, until shells just opened), in a heavy pan, in a mixture of butter-softened onions, chopped garlic and white wine, which should be brought to the boil before introducing them. Put the opened mussels aside to cool and shell later. Strain the cooking liquor through a muslin or fine sieve and reserve. Now the cod. 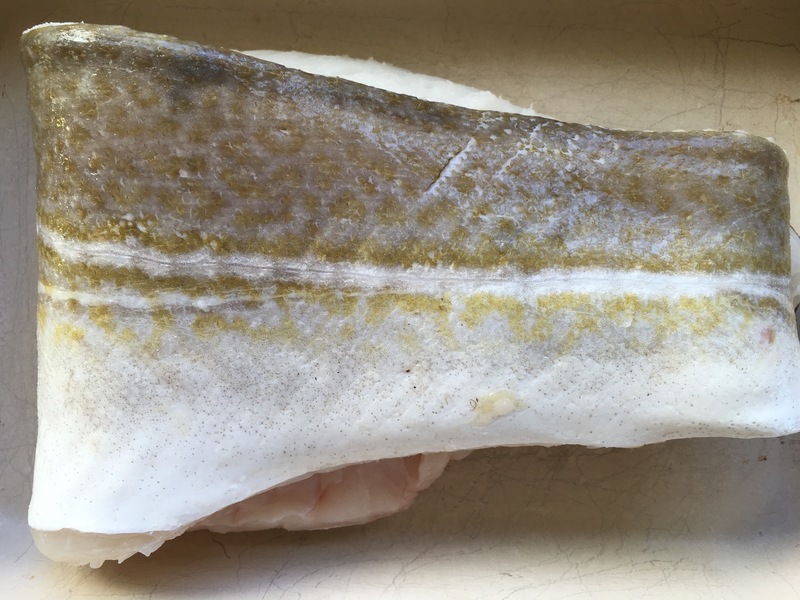 On this occasion, the local fish being still a bit on the small side, I opted for a thick and handsome fillet from the Peterhead merchant Will Clark, which had been landed only a day earlier by Buchan trawler Harvest Hope (PD120). Having skinned the fish, I then poach in the milk with a grinding of black pepper and a bay leaf, until it’s just cooked and can be easily flaked. The poaching milk can then be set aside. Back to the now cooled lobsters for dressing. Splitting them lengthways in this case, to enable all the tail meat to be extracted. Remove the stomach sacks (discard) and keep the tomalley (grey liver material). The latter adds incredible flavour and depth to the stock, so crush the water biscuits with rolling pin add to the tomalley and mix with a little cooking liquor to produce an unctuous paste. Boil up again the discarded shells and simmer before straining off for more stock, (which can always be frozen). 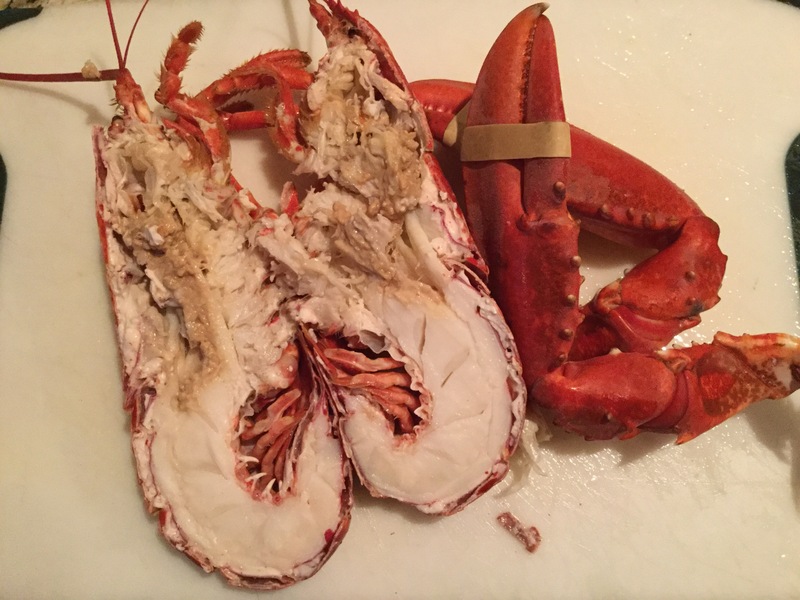 Crack open the claws with the back of a heavy kitchen knife and extract the meat whole. Next I make the chowder base, by softening the other chopped onion in the remainder of the butter and adding in the diced potato to colour a little. In with the celery too and having duly brought everything to a lovely amber hue, it’s time to combine all the stocks from the lobster boiling, cod poaching and mussel steaming and the tomalley mix, stirring purposefully into the vegetables. Bring all this to the boil and then simmer for an hour ( or into bottom oven -for the agaphiles). 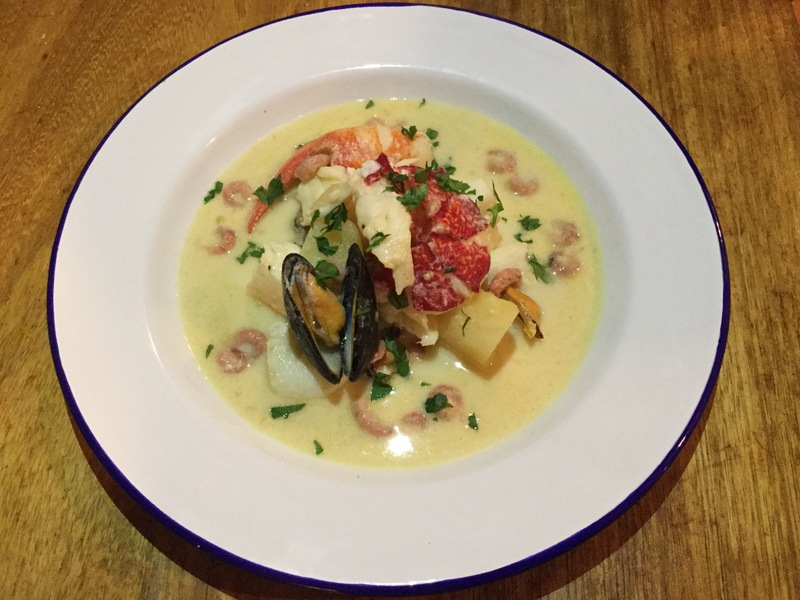 The secret, I believe, with a dish like this is not to overcook any of the fish in the first instance, so as soon as your allotted dining time approaches and only then, would I finish the chowder. Remove from the heat, crush, a little, some of the potato to thicken the sauce, and simmer again to reduce if necessary. At this point ALWAYS taste and season again if you need to, but I’m guessing the flavour has now made you smile. Add the pinch of cayenne if not! 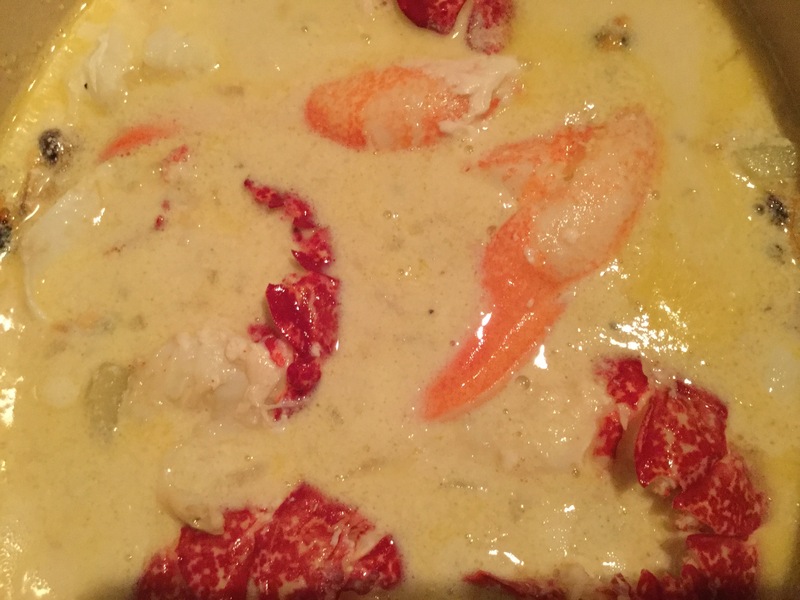 Gently and respectfully introduce the lobster, cod flakes and shelled mussels and fold into the chowder mix, which should resemble a thickish soup. I often dice the lobster tail meat, but with the lovely large cod flakes and the wonderfully plump mussels, this time I’ve left the half-tails intact, which gives superb definition and allows a little creativity when serving. Also add in the cream which puts a wonderful lustre to the mixture. Once the fish has heated through, it’ll time to serve and really I’ll leave how and with what up to you, but suffice to say, a glass of highly chilled Muscadet or Sancerre on the side, definitely wouldn’t go amiss and some roughly torn chunks of freshly baked baguette, to mop up that eminently satisfying soup. Dollop lovingly into a warmed bowl and scatter with a little chopped parsley and a few brown shrimps (if you’ve managed not to eat them all during the cooking). Best place to eat this? Well, as the mercury falls and the final oak leaves swirl around the house, I’m there by the wood burner, a Labrador at my feet and a bowlful of this blissfully satisfying and heartening, seasonal seafood on my lap. Can I join you for this one, sounds devine.